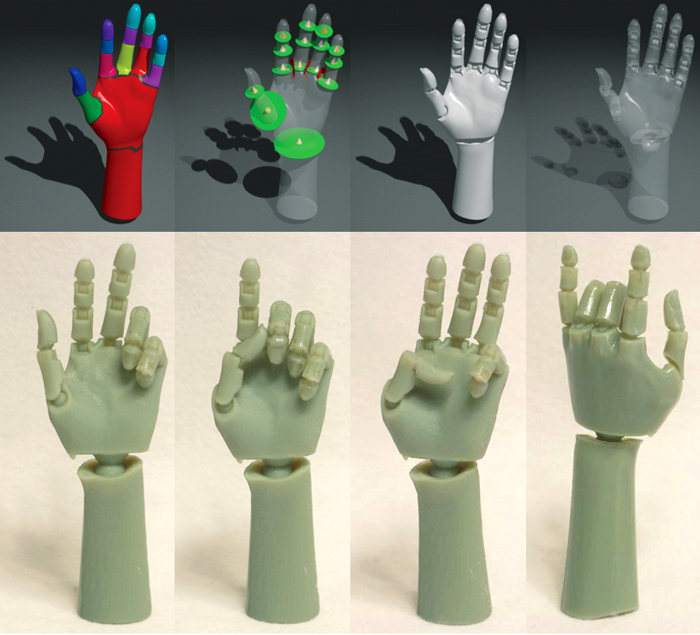 CORNELL (US) — New software takes a graphic image of a video game or movie character and translates it into a posable plastic model to be fabricated by a 3D printer. Eventually this capability might be built into games and other software, the researchers say. The project by Moritz Bächer and Hanspeter Pfister of Harvard University, Bernd Bickel of the Technische Universität Berlin, and Doug James, Cornell University associate professor of computer science, was described at the SIGGRAPH conference August 7 in Los Angeles and published in the journal Transactions on Graphics. The researchers displayed models they had made of characters created in the video game “Spore,” which allows the player to evolve an alien creature, as well as an articulated model of a human hand. A 3D printer builds a solid object by scanning across a table and depositing tiny droplets of plastic or another material, then moving upward in tiny steps to add additional layers. Professional 3D printers, used in industry for prototyping machinery, sell for $50,000 and up. The researchers suggest that character printing might be offered as an online service or perhaps as a service by hobby stores. The computer has a built-in description for each type of joint but must find the right size. The joint must be strong enough to support a particular part of the body, but “It might make the joint really huge so it sticks out through the skin, or collides with other joints, or it might be too small to print, so our algorithm has an optimization step to find the best balance,” James explains. Finally, small bumps are added to the joint parts to create friction so that the figure will hold a pose. To print a joint with moving parts, the 3D printer deposits two different materials: a plastic that forms solid parts of the figure, and a temporary material that fills in what will eventually be empty spaces. This holds the figure together during printing, but the filler essentially turns to dust when the finished figure is first moved. The work has been partially supported by the National Science Foundation. James received support from a Guggenheim fellowship and from Pixar. Test figures were printed at Disney Research Boston.